Practical Coatings Handbook from C.H.I.P.S. 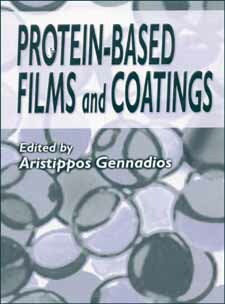 This volume presents up-to-date and detailed information on protein-based biopolymer films and coatings. Protein-Based Films and Coatings provides a comprehensive overview of the design, technology, properties, functionality, and applications of biopolymer films and coatings (edible and inedible) from plant and animal proteins. Both widely commercialized and envisioned applications of protein films are also discussed, including hard and soft gelatin capsules, microcapsules, collagen casings, and meat and produce coatings. Expert contributors provide thorough reviews of related interdisciplinary research and extensive lists of references.